Lots of spoilers after the picture – be warned! So I’ve been thinking about Game of Thrones, most especially the differences between the books and the TV show, but also what might come along in the future. It’s very rare for me to think of a TV or film being better than the books, but this may be one of those occasions – I won’t have a final view until both forms are finished. I think that the TV show is definitely benefiting from a forced economy of story line, which keeps things ticking over. Yet there are some elements where, despite the verbiage and distraction, Martin has got some wonderful things that the TV show either cannot or has not shared. I miss Lady Stoneheart. I am looking forward to the resolution of her plot in the books. 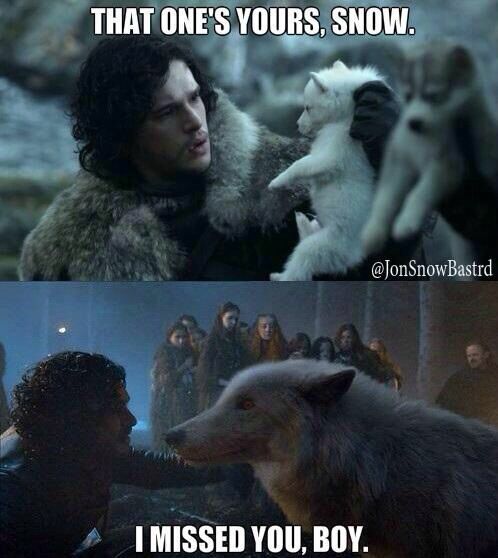 I miss the emphasis on warging by the Stark children, most especially with Jon. I miss the detailed POV account of Arya in the house of black and white, although here I think the show is doing reasonably well. I miss Jaime in the Riverlands, and the way in which that aspect of the plot is working out (and the different way in which the Dorne plot has been taken through). I have a very romantic desire to see Jaime and Brienne end up together – alive and married and having children! I don’t particularly like the different path show-Sansa has taken compared to book-Sansa. I don’t miss the ‘young Griff’ stuff. I’m not sure anybody does. Yet what next? I keep thinking about Jon Snow, and what has happened to him, and whether and how he might come back in the next book/next season. For Jon to be dead – as in, definitely, finally, no coming back in any form dead – would mean that GRRM is a bad creator, and I do not think that he is that. Quite how this is done I find a fascinating conjecture. 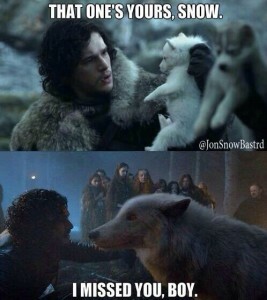 Personally I don’t think that it can happen until the wall has fallen down – and I wonder whether the betrayal of Jon and the associated betrayal of the vows by the Night’s Watch – is what ‘undoes’ the magic of the wall and leads to the southern Ingress of the Others (love what the TV show has done on them). I don’t recall the horn of Joramun being mentioned on the show, but I could be wrong on that. Oh yes, another bit I enjoyed in the books – the sailors from the Iron Islands heading for Meereen. Hmm. Yes. The show is brilliant – but actually, there is a lot in the books that hasn’t been incorporated, and it isn’t all lists of food eaten or long boring journeys along a river…. This entry was posted in culture, film review by Elizaphanian. Bookmark the permalink.